I have written about the fate of classical information interacting with black holes fairly extensively on this blog (see Part 1, Part 2, and Part 3). Reviewers of the article describing those results nearly always respond that I should be considering the fate of quantum, not classical information. In particular, they ask me to comment on what all this means in the light of more modern controversies, such as black hole complementarity and firewalls. As if solving the riddle of what happens to classical information is not nearly good enough. I should first state that I disagree with the idea that it is necessary to discuss the fate of quantum information in an article that discusses what happens to classical information. I’ll point out the differences between those two concepts here, and hopefully I’ll convince you that it is perfectly reasonable to discuss these independently. However, I have given in to these requests, and now written an article (together with my colleague Kamil Bradler at St. Mary’s University in Halifax, Canada) that studies the fate of quantum information that interacts with a black hole. Work on this manuscript explains (in part) my prolonged absence from blogging. The results we obtained, it turns out, do indeed shed new light on these more modern controversies, so I’m grateful for the reviewer’s requests after all. The firewalls have “set the physics world ablaze”, as one blogger writes. These firewalls (that are suggested to surround a black hole) have been invented to correct a perceived flaw in another widely discussed theory, namely the theory of black hole complementarity due to the theoretical physicist Leonard Susskind. I will briefly describe these in more detail below, but before I can do this, I have to define for you the concept of quantum entanglement. Quantum entanglement lies at the very heart of quantum mechanics, and it is what makes quantum physics different from classical physics. It is clear, as a consequence, that I won’t be able to make you understand quantum entanglement if you have never studied quantum mechanics. If this is truly your first exposure, you should probably consult the Wiki page about quantum entanglement, which is quite good in my view. 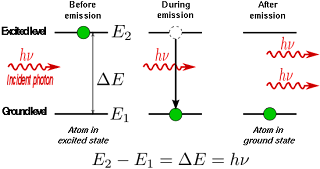 The wavefunction on the right hand side is not a product of the two initial wavefunctions, and in any case classical systems can never be brought into such a superposition of states in the first place. Another interesting aspect of quantum entanglement is that it is non-local. If A and B represent particles, you can still move one of the particles far away (say, to another part in the galaxy). They will still remain entangled. Classical interactions are not like that. At all. A well-known entangled wavefunction is that of the Einstein-Podolsky-Rosen pair, or EPR pair. This is a wavefunction just like (1), but with σ=τ=1/2√. 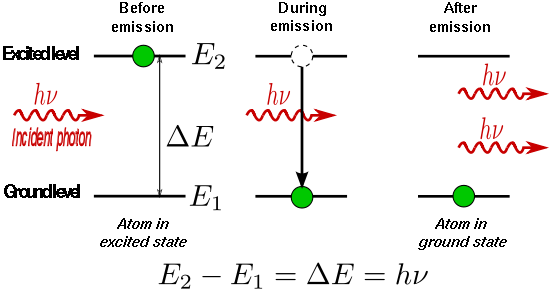 The ‘0’ vs ‘1’ state can be realized via any physical quantum two-state system, such as a spin 1/2-particle or a photon carrying a horizontal or vertical polarization. where the subscripts AR refer to the fact that the wavefunction now “lives” in the joint space AR. A and R (after entanglement) do not have individual states any longer. In this manner, entanglement was transferred from A to B. That is a quantum communication channel. Of course, lots of things could happen to the quantum entanglement on its way to Bob. For example, it could be waylayed by a black hole. If Alice sends her quantum entanglement into a black hole, can Bob retrieve it? Can Bob perform some sort of magic that will leave the black hole unentangled with A (or R), while he himself is entangled as in (3)? Whether or not Bob can do this depends on whether the quantum channel capacity of the black hole is finite, or whether it vanishes. If the capacity is zero, then Bob is out of luck. The best he can do is to attempt to reconstruct Alice’s quantum state using classical state estimation techniques. That’s not nothing by the way, but the “fidelity” of the state reconstruction is at most 2/3. But I’m getting ahead of myself. Let’s first take a look at this channel. I’ll picture this in a schematic manner where the outside of the black hole is at the bottom, and the inside of the black hole is at the top, separated by the event horizon. Imagine Alice sending her quantum state in from below. Now, black holes (as all realistic black bodies) don’t just absorb stuff: they reflect stuff too. How much is reflected depends on the momentum and angular momentum of the particle, but in general we can say that a black hole has an absorption coefficient 0≤α≤1, so that α2 is just the probability that a particle that is incident on the black hole is absorbed. So we see that if n particles are incident on a black hole (in the form of entangled quantum states |ψ⟩in), then (1−α2)n come out because they are reflected at the horizon. Except as we’ll see, they are in general not the pure quantum states Alice sent in anymore, but rather a mixture ρout. This is (as I’ll show you) because the black hole isn’t just a partially silvered mirror. Other things happen, like Hawking radiation. Hawking radiation is the result of quantum vacuum fluctuations at the horizon, which constantly create particle-antiparticle pairs. If this happened anywhere but at the event horizon, the pairs would annihilate back, and nobody would be the wiser. Indeed, such vacuum fluctuations happen constantly everywhere in space. But if it happens at the horizon, then one of the particles could cross the horizon, while the other (that has equal and opposite momentum), speeds away from it. That now looks like the black hole radiates. And it happens at a fixed rate that is determined by the mass of the black hole. Let’s just call this rate β2. As you can see, the rate of spontaneous emission does not depend on how many particles Alice has sent in. In fact, you get this radiation whether or not you throw in a quantum state. These fluctuations go on before you send in particles, and after. They have absolutely nothing to do with |ψ⟩in. They are just noise. But they are (in part) responsible for the fact that the reflected quantum state ρout is not pure anymore. But I can tell you that if this were the whole story, then physics would be in deep deep trouble. This is because you cannot recover even classical information from this channel if α=1. Never mind quantum. In fact, you could not recover quantum information even in the limit α=0, a perfectly reflecting black hole! (I have not shown you this yet, but I will). 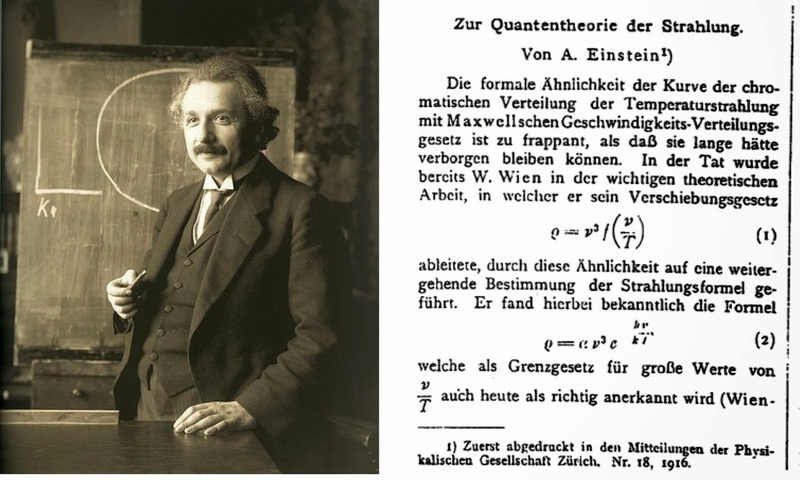 What Einstein discovered in that paper is that you can derive Planck’s Law (about the distribution of radiation emanating from a black body) using just the quantum mechanics of absorption, spontaneous emission, and stimulated emission of radiation. Stimulated emission is by now familar to everybody, because it is the principle upon which Lasers are built. 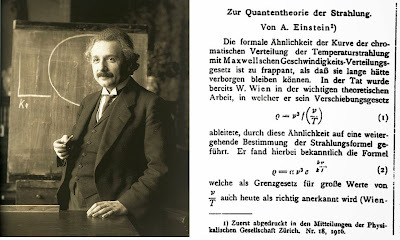 What Einstein showed in that paper is that stimulated emission is an inevitable consequence of absorption: if a black body absorbs radiation, it also stimulates the emission of radiation, with the same exact quantum numbers as the incoming radiation. In other words, all black bodies are quantum copying machines! Actually, now that you mention it, yes it is, and the law is much more stringent than the law against classical copying (of copy-righted information, that is). The law (called the no-cloning theorem) is such that it cannot–ever–be broken, by anyone or anything. The reason why black bodies can be quantum copying machines is that they don’t make perfect copies, and the reason the copies aren’t perfect is the presence of spontaneous emission, which muddies up the copies. This has been known for 30 years mind you, and was first pointed out by the German-American physicist Leonard Mandel. Indeed, only perfect copying is disallowed. There is a whole literature on what is now known as “quantum cloning machines” and it is possible to calculate what the highest allowed fidelity of cloning is. When making two copies from one, the highest possible fidelity is F=5/6. That’s an optimal 1->2 quantum cloner. And it turns out that in a particular limit (as I point out in this paper from 2006) black holes can actually achieve that limit! I’ll point out what kind of black holes are optimal cloners further below. In addition to the absorbed/reflected radiation, there is spontaneous emission (in red), and there is stimulated emission (in blue). There is something interesting about the stimulated “clones”. (I will refer to the quantum copies as clones even though they are not perfect clones, of course. How good they are is central to what follows). Note that the clone behind the horizon has a bar over it, which denotes “anti”. Indeed, the stimulated stuff beyond the horizon consists of anti-particles, and they are referred to in the literature as anti-clones, because the relationship between ρout and ρ¯out is a quantum mechanical NOT operation. (Or, to be technically accurate, the best NOT you can do without breaking quantum mechanics.) That the stimulated stuff inside and outside the horizon must be particles and anti-particles is clear, because the process must conserve particle number. We should keep in mind that the Hawking radiation also conserves particle number. The total number of particles going in is n, which is also the total number of particles going out (adding up stuff inside and outside the horizon). I checked. Now that we know that there are a bunch of clones and anti-clones hanging around, how do we use them to transfer the quantum entanglement? Actually, we are not interested here in a particular protocol, we are much more interested in whether this can be done at all. If we would like to know whether a quantum state can be reconstructed (by Bob) perfectly, then we must calculate the quantum capacity of the channel. While how to do this (and whether this calculation can be done at all) is technical, one thing is not: If the quantum capacity is non-zero then, yes, Bob can reconstruct Alice’s state perfectly (that is, he will be entangled with R exactly like Alice was when he’s done). If it is zero, then there is no way to do this, period. In the paper I’m blogging about, Kamil and I did in fact calculate the capacity of the black hole channel, but only for two special cases: α=0 (a perfectly reflecting black hole), and α=1 (a black hole that reflects nothing). The reason we did not tackle the general case is that at the time of this writing, you can only calculate the quantum capacity of the black hole channel exactly for these two limiting cases. For a general α, the best you can do is give a lower and an upper bound, and we have that calculation planned for the future. But the two limiting cases are actually quite interesting. First: α=0. In that case the black hole isn’t really a black hole at all, because it swallows nothing. Check the figure up there, and you’ll see that in the absorption/reflection column, you have nothing in black behind the horizon. Everything will be in front. How much is reflected and how much is absorbed doesn’t affect anything in the other two columns, though. So this black hole really looks more like a “white hole“, which in itself is still a very interesting quantum object. Objects like that have been discussed in the literature (but it is generally believed that they cannot actually form from gravitational collapse). But this is immaterial for our purposes: we are just investigating here the quantum capacity of such an object in some extreme cases. For the white hole, you now have two clones outside, and a single anticlone inside (if you would send in one particle). A quick caveat: Even though I write that there are two clones and a single anti-clone after I send in one particle, this does not mean that this is the actual number of particles that I will measure if I stick out my particle detector, dangling out there off of the horizon. This number is the mean expected number of particles. Because of vacuum fluctuations, there is a non-zero probability of measuring a hundred million particles. Or any other number. The quantum channel is really a superposition of infinitely many cloning machines, with the 1-> 2 cloner the most important. This fundamental and far-reaching result is due to Kamil. 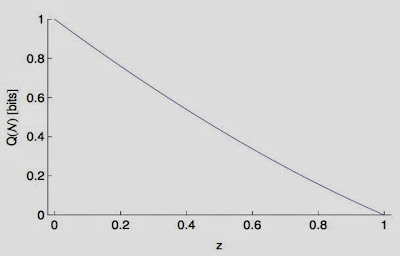 In that figure, I show you the capacity as a function of z=e−ω/T, where T is the temperature of the black hole and ω is the frequency (or energy) of that mode. For a very large black hole the temperature is very low and, as a consequence, the channel isn’t very noisy at all (low z). The capacity therefore is nearly perfect (close to 1 bit decoded for every bit sent). When black holes evaporate, they become hotter, and the channel becomes noisier (higher z). For infinitely small black holes (z=1) the capacity finally vanishes. But so does our understanding of physics, of course, so this is no big deal. Actually, it is a somewhat big deal, because I can tell you that if it wasn’t for that blue stimulated bit of radiation in that figure above, you couldn’t do the reconstruction at all! So, now we come to the second result of the paper. You actually cannot. The capacity of the channel into the black hole (what is known as the complementary channel) is actually zero because (and this is technical speak) the channel into the black hole is entanglement breaking. You can’t reconstruct perfectly from a single clone or anti-clone, it turns out. So, the no-cloning theorem is saved. Now let’s come to the arguably more interesting bit: a perfectly absorbing black hole (α=1). By inspecting the figure, you see that now I have a clone and an anti-clone behind the horizon, and a single clone outside (if I send in one particle). Nothing changes in the blue and red lines. But everything changes for the quantum channel. Now I can perfectly reconstruct the quantum state behind the horizon (as calculating the quantum capacity will reveal), but the capacity in front vanishes! Zero bits, nada, zilch. If α=1, the channel from Alice to Bob is entanglement breaking. It is as if somebody had switched the two sides of the black hole! Inside becomes outside, and outside becomes inside! Now let’s calm down and ponder what this means. First: Bob is out of luck. Try as he might, he cannot have what Alice had: the same entanglement with R that she enjoyed. Quantum entanglement is lost when the black hole is perfectly absorbing. We have to face this truth. I’ll try to convince you later that this isn’t really terrible. In fact it is all for the good. But right now you may not feel so good about it. But there is some really good news. To really appreciate this good news, I have to introduce you to a celebrated law of gravity, the equivalence principle. The principle, due to the fellow whose pic I have a little higher up in this post, is actually fairly profound. The general idea is that an observer should not be able to figure out whether she is, say, on Earth being glued to the surface by 1g, or whether she is really in a spaceship that accelerates at the rate of 1g (g being the constant of gravitational acceleration on Earth, you know: 9.81 m/sec2). The equivalence principle has far reaching consequences. It also implies that an observer (called, say, Alice), who falls towards (and ultimately into) a black hole, should not be able to figure out when and where she passed the point of no return. The horizon, in other words, should not appear as a special place to Alice at all. But if something dramatic would happen to quantum states that cross this boundary, Alice would have a sure-fire way to notice this change: she could just keep the quantum state in a protected manner at her disposition, and constantly probe this state to find out if anything happened to it. That’s actually possible using so-called “non-demolition” experiments. So, unless you feel like violating another one of Einstein’s edicts (and, frankly, the odds are against you if you do), you better hope nothing happens to a quantum state that crosses from the outside to the inside of a black hole in the perfect absorption case (α=1). Fortunately, we proved (result No. 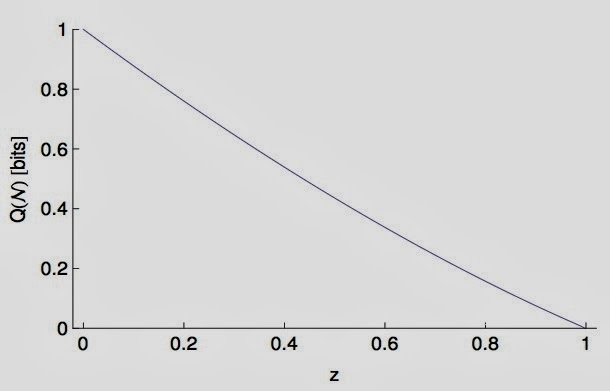 3) that you can perfectly reconstruct the state behind the horizon when α=1, that this capacity is non-zero. And that as a consequence, the equivalence principle is upheld. This may not appear to you as much of a big deal when you read this, but many many researchers have been worried sick about this, that the dynamics they expect in black holes would spell curtains for the equivalence principle. I’ll get back to this point, I promise. But before I do so, I should address a more pressing question. The truth is, today we don’t know how to answer this question. We understand that Alice’s quantum state is safe and sound behind the horizon–for now. There is also no reason to think that the ongoing process of Hawking radiation (that leads to the evaporation of the black hole) should affect the absorbed quantum state. But at some point or other, the quantum black hole will become microscopic, so that our cherished laws of physics may lose their validity. At that point, all bets are off. We simply do not understand today what happens to quantum information hidden behind the horizon of a black hole, because we do not know how to calculate all the way to very small black holes. Having said this, it is not inconceivable that at the end of a black hole’s long long life, the only thing that happens is the disappearance of the horizon. If this happens, two clones are immediately available to an observer (the one that used to be on the outside, and the one that used to be inside), and Alice’s quantum state could finally be resurrected by Bob, a person that no doubt would merit to be called the most patient quantum physicist in the history of all time. Now what does this all mean for black hole physics? I have previously shown that classical information is just fine, and that the universe remains predictable for all times. This is because to reconstruct classical information, a single stimulated clone is enough. It does not matter what α is, it could even be one. Quantum information can be conveyed accurately if the black hole is actually a white hole, but if it is utterly black then quantum information is stuck behind the horizon, even though we have a piece of it (a single clone) outside of the horizon. But that’s not enough, and that’s a good thing too, because we need the quantum state to be fully reconstructable inside of the black hole, otherwise the equivalence principle is hosed. And if it reconstructable inside, then you better hope it is not reconstructable outside, because otherwise the no-cloning theorem would be toast. So everything turns out to be peachy, as long as nothing drastic happens to the quantum state inside the black hole. We have no evidence of something so drastic, but at this point we simply do not know. Now what are the implications for black hole complementarity? 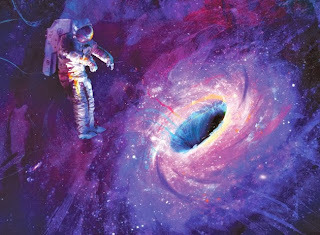 The black hole complementarity principle was created from the notion (perhaps a little bit vague) that, somehow, quantum information is both reflected and absorbed by the black hole channel at the same time. Now, given that you have read this far in this seemingly interminable post, you know that this is not allowed. It really isn’t. What Susskind, Thorlacius, and ‘t Hooft argued for, however, is that it is OK as long as you won’t be caught. Because, they argued, nobody will be able to measure the quantum state on both sides of the horizon at the same time anyway! Now I don’t know about you, but I was raised believing that just because you can’t be caught it doesn’t make it alright to break the rules. And what our more careful analysis of quantum information interacting with a black hole has shown, is that you do not break the quantum cloning laws at all. Both the equivalence principle and the no-cloning theorem are perfectly fine. Nature just likes these laws, and black holes are no outlaws. What about firewalls then? Quantum firewalls were proposed to address a perceived inconsistency in the black hole complementarity picture. But you now already know that that picture was inconsistent to begin with. Violating no-cloning laws brings with it all kinds of paradoxes. Unfortunately, the firewall hypothesis just heaped paradoxes upon paradoxes, because it proposed that you have to violate the equivalence principle as well. This is because that hypothesis assumes that all the information was really stored in the Hawking radiation (the red stuff in the figures above). But there is really nothing in there, so that the entire question of whether transmitting quantum information from Alice to Bob violates the concept of “monogamy of entanglement” is moot. The Hawking radiation can be entangled with the black hole, but it is no skin off of Alice or Bob, that entanglement is totally separate. So, all is well, it seems, with black holes, information, and the universe. We don’t need firewalls, and we do not have to invoke a “complementarity principle”. Black hole complementarity is automatic, because even though you do not have transmission when you have perfect reflection, a stimulated clone does make it past the horizon. And when you have perfect transmission (α=1) a stimulated clone still comes back at you. So it is stimulated emission that makes black hole complementarity possible, without breaking any rules. Of course we would like to know the quantum capacity for an arbitrary α, which we are working on. One result is already clear: if the transmission coefficient α is high enough that not enough of the second clone is left outside of the horizon, then the capacity abruptly vanishes. Because the black hole channel is a particular case of a “quantum depolarizing channel”, discovering what this critical α is only requires mapping the channel’s error rate p to α.
I leave you with an interesting observation. Imagine a black hole channel with perfect absorption, and put yourself into the black hole. Then, call yourself “Complementary Alice”, and try to send a quantum state across the horizon. You immediately realize that you can’t: the quantum state will be reflected. The capacity to transmit quantum information out of the black hole vanishes, while you can perfectly communicate quantum entanglement with “Complementary Bob”. Thus, from the inside of the perfectly absorbing black hole it looks just like the white hole channel (and of course the reverse is true for the perfectly reflecting case). Thus, the two channels are really the same, just viewed from different sides! This becomes even more amusing if you keep in mind that (eternal) black holes have white holes in their past, and white holes have black holes in their future.